Jordan has officially hit the ground running (with his braces and walker) in Akron Children’s day rehab program, which we call Muscle School. 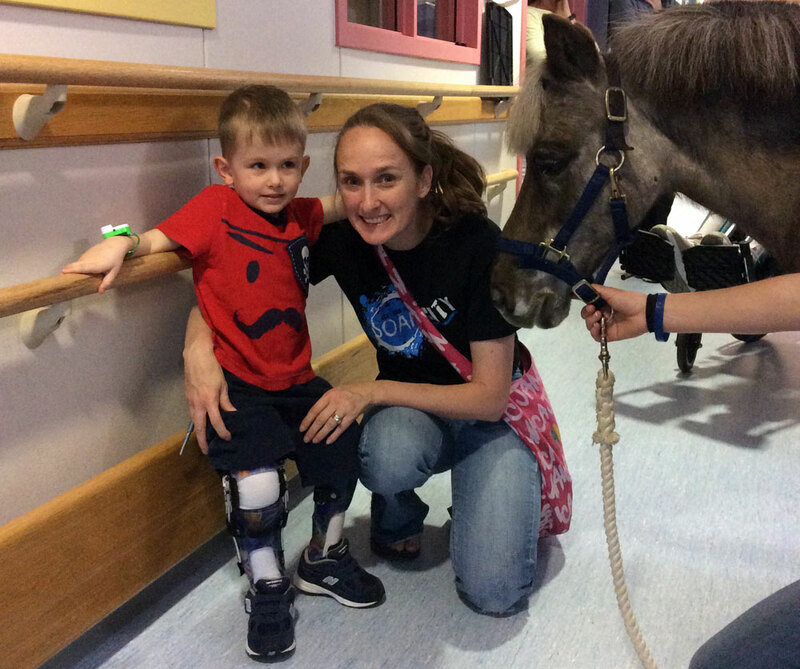 We are beyond blessed to have a program that will allow children to receive such an extensive amount of therapy after surgery. Dr. Baird first mentioned it when we met in January. He asked if we thought Jordan would be able to handle it. Well, of course he will. And to be honest, he has shown determination throughout his journey so we felt he would roll with going and “playing” at Doctor’s House. In the back of our minds we had some reservations. We wondered if he would enjoy himself, miss his teachers and friends at school, or be just totally wiped out after being there for 5 hours a day – 2 hours of occupational therapy, 2 hours of physical therapy and lunch with Mrs. Ronda or Mr. Brett. The first few days went OK because I was able to stay with him during his evaluations. As we strapped his braces on his swollen feet from having his surgery, I could only hold my breath wondering how much strength and endurance he might have lost. Dr. Jones told us it could take 4-6 months before Jordan was back to where he was before the surgery. On the first day, Dr. Baird happened to be walking down the hall when Jordan came out of the room on his little sea legs and walker. On Day 2, Jordan was practically chasing me around the therapy gym. He was braced a little higher and Brian from Hanger Prosthetics was there. Thank you, Jesus, for the progress we saw. After these few weeks, we’ve seen a side of Jordan that we had not seen before. He and Gabriella have both had a pretty easy time with separation, Jordan especially. We could drop him off at school or Sunday school and he would go right in without a tear. He was pretty friendly and would at least shake someone’s hand or give them a high five. It may be the age or just an emotional stance but he has given more cold shoulders and has clung more tightly to our bodies more than ever. We pray that as time goes on he will become more confident and friendly to those who are so excited to invite him to their high fives and enjoy his sweet infectious smile. Jordan has met some new friends while being in Muscle School, which has helped the day become a little more special. The Doggie Brigade is a highlight. There are 3 dogs that make therapy fun. Chris Witschey’s Gracie and Tank are 2 who come to visit. However, on Thursday, there was an extra special visitor that brightened the halls. 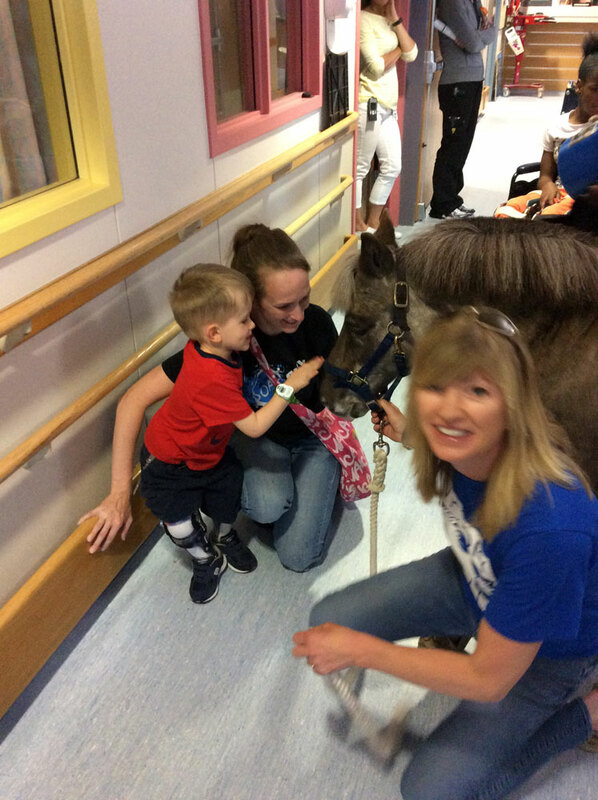 I was visiting with some friends on the 7th floor when the child life specialist Krista told us Petie the Pony was going to be up on the floor. Now there’s a celebrity for you. I have heard, seen pictures, but have not had the pleasure of meeting Petie. Krista paged day rehab to bring the kiddos up to meet this famous little horse. The crazy part was Jordan and I had been talking about our trip with his preschool class the next day and he asked if there would be horses there. This was even better. Jordan stood with his braces and pet his new friend. We can’t say enough about the volunteers who bring in their animals to help make work not be work at all. As I was thinking of our journey the other day, I came to thinking about how blessed we have been. We have always prayed for miracles or just prayed in general for surgeries, good food to eat, friends at school, healing, or to be able to walk. I realize miracles are happening all around us even if we don’t acknowledge them as miracles. The one that specifically comes to mind is praying for Jordan before his surgery and hoping for something to happen to that hip that would allow him to walk. Sure, there was the fact that the surgery would help decrease pain and keep his hip from coming out of place, but we wanted something more. We seem to have come to the miracle of having Akron Children’s Muscle School. This is an opportunity that doesn’t come every day. In fact you need to have something major happen in order to qualify to go. This allows Jordan to work and play while engaging his little body and pushing it to the point that when he gets in the car, all his eyes and body can think about is dreamland.